June may be the gateway to summer in the Northern Hemisphere, but the birding still delivers the thrills of spring migration when you have access to the right birds’ breeding grounds. Songbirds are still singing, so go find them! I visited Letchworth State Park this weekend, renowned for a ridiculous density of breeding wood warblers. Based on the songs that surrounded us as we hiked Trail #15, the “Grand Canyon of the East” is awash in warblers, including my FOY Louisiana Waterthrush. Corey had a surprising wealth of birds to choose from for his Best Bird of the Weekend. Was it the Least Bittern nearly flew into his head? The Cerulean Warbler singing up a storm? The nestling Ruby-throated Hummingbirds being fed by their saintly mother? The Bobolinks singing their electronic songs during their displays? 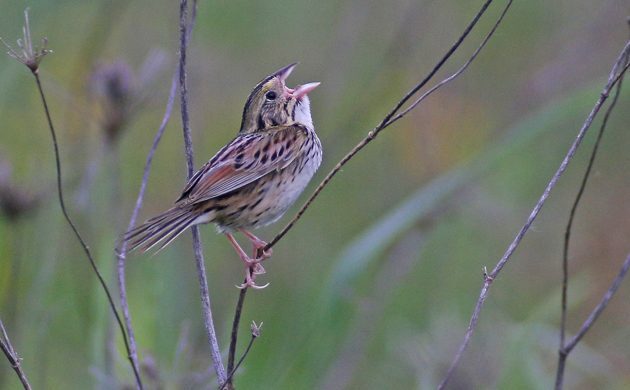 It could have been any of those from among the over 100 species that crossed Corey’s path this weekend but of them all he chose the singing Henslow’s Sparrow at the Shawangunk Grasslands National Wildlife Refuge as this state-threatened species is hard to see and it gave Corey the best looks he ever had of the species. I certainly can’t beat a Henslow’s, that is a hard thing to do, but was pleased with spotting a few Pallid Swifts amongst the Common Swifts over Imperia, Italy. I spotted an American Kestrel wheeling over the backstreets of Port Richmond here in Philly. Totally unexpected bird that made my day! I tookm a bit of time for myself while up in Seattle, and walked around the lake in a local park. It has been many years since I got to watch Cedar Waxwings….I forgot how beautiful they are.